At Keepers Kennels we welcome all types of dogs from the very old, to young pups; from Great Danes to Chihuahuas; single dogs and family groups are always welcome. Pamper Your Pet Here at Keepers Kutz Grooming Parlour, I believe that people aren't the only ones who should be pampered. Your pet deserves a day of grooming, too! Bring your furry friend over and well make their fur shine-guaranteed. For all the latest Keepers Kennels news, you can keep yourself up to date by reading the posts on our news page, we update our news regularly so check back often! A day at the kennels starts at 8am when we go down the kennels and give the dogs their breakfast and let them out for a run around while we clean the kennel. They have about half an hour out and if they like other dogs we try to put them out together to play. Around 1pm we go down to check on the dogs and let them out again for a play. Again about half an hour. Then at 5pm we go down to give the dogs their dinner and another run around. When we come up we give the dogs a bonio and put them to bed for the evening. "We did our research before choosing a kennel for our special pup, we viewed a few unsavoury kennels and then were recommended to you at Keepers Kennels, and " hey presto" we were very impressed Harley enjoyed looking round and we were left to look around which was impressive a very clean and tidy environment for our special member of our family." "Both dogs are happy to come. They like Alix, as I do. She is very friendly and helpful. I would have no hesitation in recommending anyone to come. In fact, I have already set one lady with a JRT and she seemed very satisfied with the results." 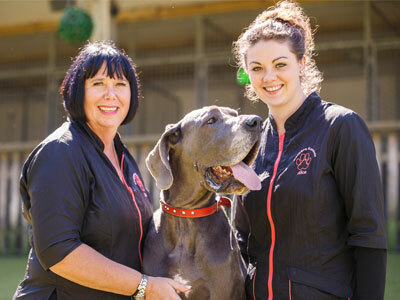 "We have used Keepers Kennels for over 2 years now and are very happy with the service that they provide. Lilly our staffie loves going there and never gives us a second look when we drop here off!!. She is happy spending time in the kennels and is always well looked after and looks great when we pick her up. Lisa and the girls are all very lovely, happy ladies and always very friendly and welcoming. We will always use Keepers Kennels to look after our dogs as we know that they are in safe hands which is great peace of mind when you are away from them." "My dog has been going to Keepers for 5 years since she was a puppy. Keepers is always spotlessly clean, good value for money and they treat the dogs like members of the family"
"I have used Keepers Kennels for about six years now. The Dunlop family are a smashing bunch and Bailey my 10 year old Golden Retreiver loves staying with them. The kennels are very clean and well maintained. Lisa is always updating and improving them to make life easier for our treasured pets more comfortable. Bailey has been known on more than one occasion to run back down to the kennel when I have arrived to take him home." "In all 5 years of our black Labrador staying at Kepeers Kennels, the genuine care and attention he gets is second to none! Sue, Lisa, Alex and Billy are amazing with him, and there is no hesitation when we drive down the approach with him in the car - he's up and tail wagging! We have total peace of mind, and know that he is in good hands and he is even matched up with other dogs he can go out and play with during his stay! We have no hesitation in recommending Keepers"
"Thank you for doing such a nice cut on barney you always make us Welcome will be recommending your service to friends thanks again"
Keepers Kennels are open every day from 8am - 6pm except Christmas Day, Boxing Day and New Years Day. The latest you can drop off your dog is 5pm, this allows us enough time to settle your dog into their new surroundings. Keepers Kennels have been providing boarding kennels for dogs of all sizes for over 8 years and have established a very good reputation within the local community as the best boarding kennel in the Horsham area. We keep our facilities clean and well maintained and all of our staff are professional and friendly dog lovers. If you would like to enquire about the availability of our boarding kennels or dog grooming service please get in touch via the contact page or using the details below.